The Nigerian Army has discovered a shallow grave in its search of retired Major General Idris Alkali, the immediate past Chief of Administration (Army). General Officer Commanding 3 Division, Major General Benson Akinroluyo, disclosed this at a press briefing on Friday in Plateau State. According to him, Major General Alkali was killed and buried in a shallow grave in an area popularly known as, “No man’s land” in a community on the outskirt of Jos metropolis. 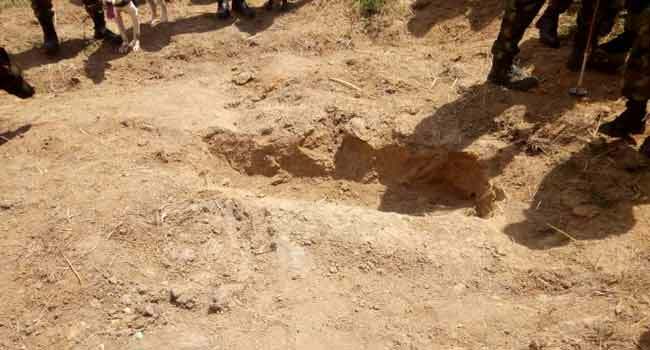 The shallow grave where Major General Idris Alkali was reportedly buried. “You would recall that on September 2, 2018, at about 8:00pm, unknown gunmen attacked a shopping complex located at Lafande Community on the outskirt of Jos metropolis in Dura-Du District of Jos South Local Government Area of Plateau State,” Major General Akinroluyo told reporters. During the protest, General Officer Commanding said scores of youths blocked the Eastern Bypass with stones and other dangerous objects. He disclosed that the late general who recently disengaged from the Nigerian Army was travelling alone in his black Toyota Corolla car from Abuja to Bauchi via Jos same day. Akinroluyo said they gathered from a credible source that the Akali’s car was stopped and he introduced himself as a general to the hoodlums who had barricaded the road that he was just passing through to Bauchi. He explained that the senior officer was thereafter assaulted and killed, after which his money, phones, and valuables were “shared by those who killed him”. He revealed further that the body of the late military officer was moved to somewhere else while his car was driven and pushed into an abandoned mining pit filled with water. “The irate youths who followed his car to the abandoned mining pit filled with water on many tri-cycles popularly known as “Keke NAPEP” jubilated for reason best known to them or for mission accomplished.